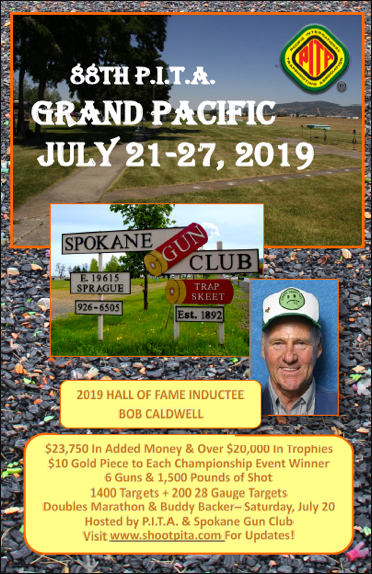 Once again this year the PITA will be providing new wired BRB Voice Calls on every trap at the PITA Grand Pacific to be held at the Spokane Gun Club July 21-27, 2019. We will be offering these 20-sets (used for the Grand Pacific only) to gun clubs for $895.00 per set, first come-first served – so don’t wait to order! This is a great deal for essentially brand new BRB Voice Calls and they will sell fast. Contact Mike Riggs at riggsconstinc@gmail.com or John Adams at jadams@eotnet.net to order. Payment will be required to confirm order. If your club wishes to add shoots/marathons contact your State or Provincial Secretary for approval. Bulkley Valley Rod & Gun Club has added two marathons to the calendar: March 30 (up to 500 doubles) and April 27 (up to 500 handicap). If your club wishes to add shoots/marathons contact your State or Provincial Secretary for approval. (2/24/19) A High Over All shoot off was held Saturday, February 23 at Del Norte Gun Club and the Newman Swamp Rats to determine the HOA winner and the CA HOA winner. Our recent bank reconciliation shows the PITA has a number checks issued to shooters that were neither cashed or deposited – UPDATED 4/8/19. If you have such a check please cash or deposit it. If your name appears on this list (click here) please call Kay at 208-312-0314 today. Thanks for your help with this matter. Multiplex results are posted. Check your scores and let us know of any errors or omissions before the Saturday deadline.